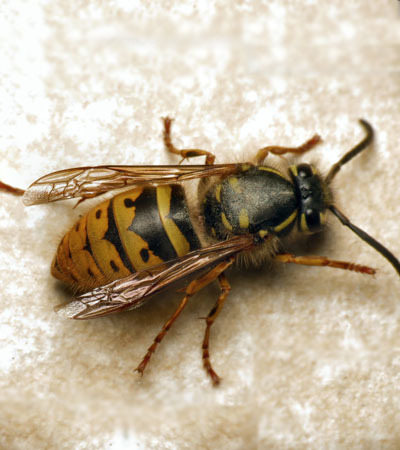 Pest UK / Pests / Should You Treat a Wasps Nest Yourself? Should You Treat a Wasps Nest Yourself? Wasps are of the order Hymenoptera, which also includes bees and ants, all stinging insects are of this order. The most often seen types of wasps in the UK are the Common Wasp and the German Wasp. They build nests from a substance similar to paper mache. The Queen will originally build a nest the size of a golf ball and this will increase as the drones take over upkeep. You may be wondering if you should be treating a wasp nest yourself, we would always advise against such action due to the following reasons. Using bug/wasp spray- This is useful for individual insects flying around but a wasp nest at its peak can have between 8,000 to 10,000 wasps. That is a lot of money on spray cans. Wasps release a pheromone when they feel threatened which can attract the rest of the hive and set them all to stinging the presumed threat. Unlike bees wasps can sting multiple times, and while a sting from one wasp isn’t normally dangerous, 30 or 40 stings at the same time could kill you. Wasp stings are painful at best and at worst can cause anaphylaxis. This is considered a medical emergency by the NHS and they recommend calling 999. Children, the elderly and those with allergies, and household pets are particularly sensitive to wasp stings. You may see posts or videos online suggesting DIY methods of removal. These are not recommended by the BPCA, the governing body for all professional pest control companies in the UK. As they will be unlikely to work. For these reason we would always recommend that treating a wasp nest yourself is not the best solution to your problem. A PESTUK technician will have the technical expertise and also access to a range of professional insecticides not available to the general public. They will have the appropriate equipment to treat the nest from a safe distance and the clothing to avoid being stung. the entrance to the nest will be treated with a modern biodegradable insecticide that is not highly toxic to mammals, but is extremely so to the hymenopterous group of insects. PESTUK are full members of the BPCA, the governing body for professional pest control companies. Membership is earned not bought and companies must show they have full insurance, relevant training and are subject to review to ensure they continue to provide the correct service.